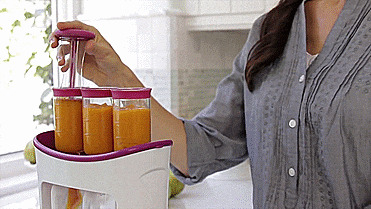 With the Baby Food Squeeze Station, it's quick and easy! It's a one-stop unit that presses your delicious, homemade baby food into easy to store and ready to serve pouches. Do you travel frequently with your Baby? Bring along as many pouches you made along as well. It's PERFECT for travelling since breakfast, lunch and dinner comes easy. It's extremely easy to operate so you don't have to worry at all. Dishwasher and freezer safe, BPA, PVC and Phthalate free. Great product, easy to use, and time saving. Making baby food is already time-consuming and this saved me a lot of time trying to bag my own baby food. It also saves space in my freezer versus glass or plastic containers. Ordered this over a year ago, still use it all the time. My son is now 6 and I make fruit pouches for him for school lunches, or beach trips. My mom asks me to make them for her for her lunches. It’s like a fresh fruit slushy if you freeze them. Perfect for all ages to get their fruit in for the day. Just blend fruit or veggies to juice almost, put in pouch, freeze. Don’t hesitate to buy this product. It will be your best investment yet. Love this squeeze station! It's such a great price and so easy to use! I love that it comes with some pouches but I ordered the box of 30 because of the awesome price. My baby loved this he's been using it since 2 and now his 4 he just treat it as a healthy snack(we put jellies in there). Strongly recommend for new mommies! LOVE these pouches! All 4 of my children use them. The older kids like using them for applesauce and yogurt. The younger kids eat yogurt or fruit/veggie blends. It's been much cheaper than buying the pre made pouches. I make up some as needed but I also make and freeze plenty. Then when we will be out for the day I put a frozen one in the diaper bag and it's thawed out by the time we need it. I would definitely recommend these pouches.